Today's post is a very special one for me. I am emotionally and ethnically rooted to the things that am going to talk about today and had been wanting to do this since a very long time. As I have mentioned about my ethnicity earlier, this post is going to be focused on two very important aspects of Assamese Culture. One being the Traditional Assamese Jewellery and the other Muga Silk of Assam. The making of Assamese Jewellery with pure gold dates hundreds of centuries. 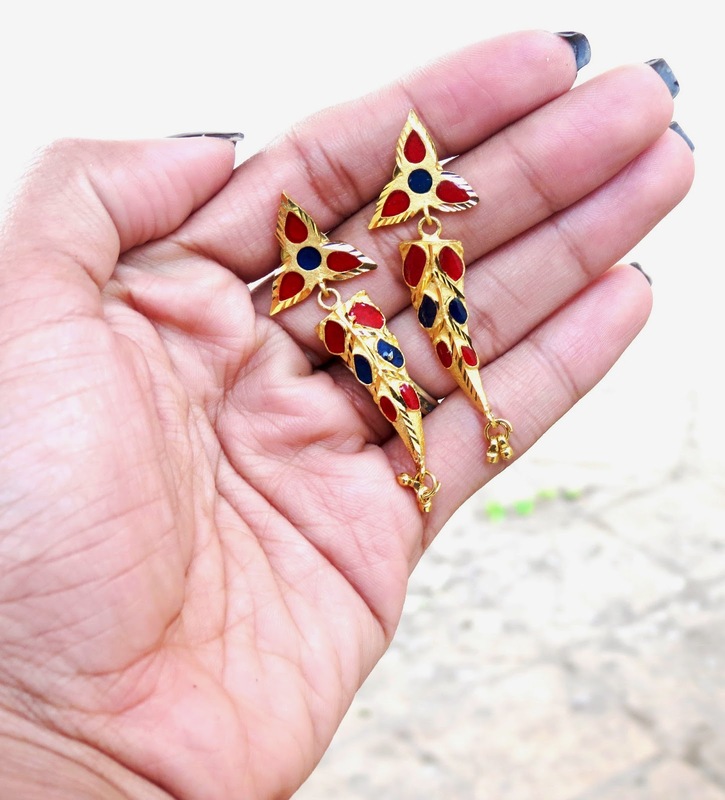 This Jewellery is typically handmade with designs depicting the natural flora and fauna of the region. 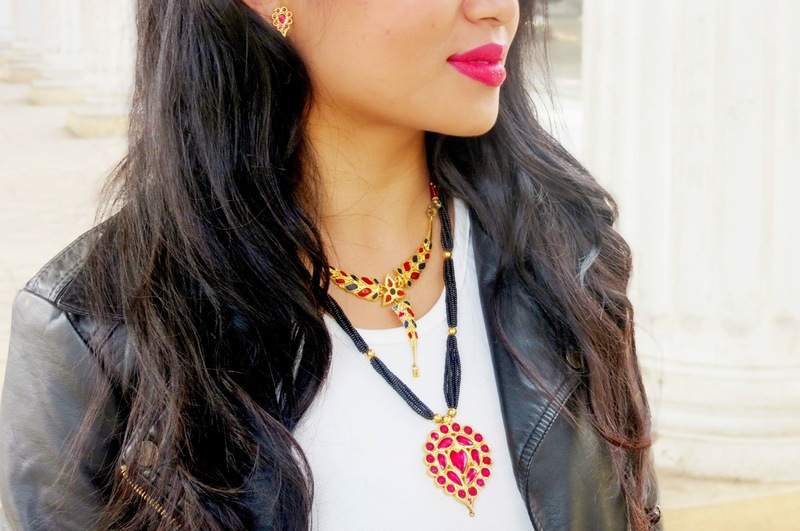 These Jewelleries are mostly encrusted with vibrant coloured gemstones or Mina work which looks great with the traditional attire of Assam, the Mekhela Chador. 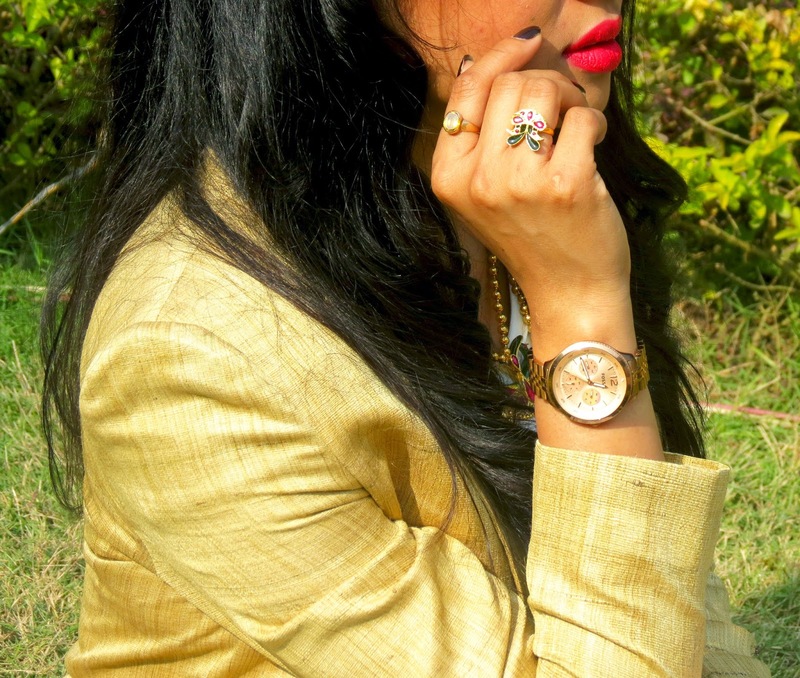 Today for this post I am wearing Four different types of jewellery. Two in the first look and two in the second look. In this look, the first one is known as Luka Paro (the pigeon shape). As the name suggests it is inspired by pigeons. Here, we can see it is a pendant having the design of two pigeons sitting back to back, as if they are hiding from each other. Hence the name Luka(hiding) Paro(pigeon). This pendant is then attached to a string of gold beads. According to prefference it can also be attached with colourful beads. Similarly the second pendant, Joonbiri, is also attached to a string of gold beads. "Joonbiri" meaning the design of the Moon (Joon). I am also wearing the matching ring and ear rings from the respective sets of the jewellery. Now let us talk about Muga Silk. This Golden Silk is not only a unique silk endemic to Assam, but also a symbol of Assamese Culture and a part of Traditional attire of the region. Muga silk is one of three variant of silks produced in the state. Paat Silk, which looks like regular silk, is used to make Mekhela Chador and Saares in various colours, and also Kurtas for both men and women. Endi Silk, which is a Warm Silk, is used in making shawls and quilts and last but not the least Muga Silk, used exactly like Paat Silk. The speciality of Muga Silk is its bright golden colour. It is superior to any other silk available worldwide in every respect and is much more durable. It can be washed and surprisingly, the golden colour and brightness of this silk enhances after every wash. Even after washing, it remains so durable that it generally outlives the wearer. Supposedly, it is one of the costliest Silks in the world. Muga Silk is one of my favourite silks and being an Assamese, I do have the Traditional Muga silk Mekhela Chador as per norms. As we know, when it comes to Traditional Attires we can't really wear them everyday. Hence I wanted Muga Silk in a form in my wardrobe which I can incorporate in my everyday wears. To find a way out, I decided to design a blazer myself from a piece of plain Muga Cloth that I had. Finally, when my Muga Blazer was ready, I was convinced enough that I can pair this with nearly anything I wear, and almost all the colours that I like. I must admit it is one of the most gorgeous and classy piece of cloth that I own. I would love to know how did you like this Muga Blazer through your valuable comments. I like mixing and matching, experimenting, and fusioning with traditional and contemporary accents in my outfits. So for the first look today I tried to keep the ethnic essence present, but in a contemporary way. 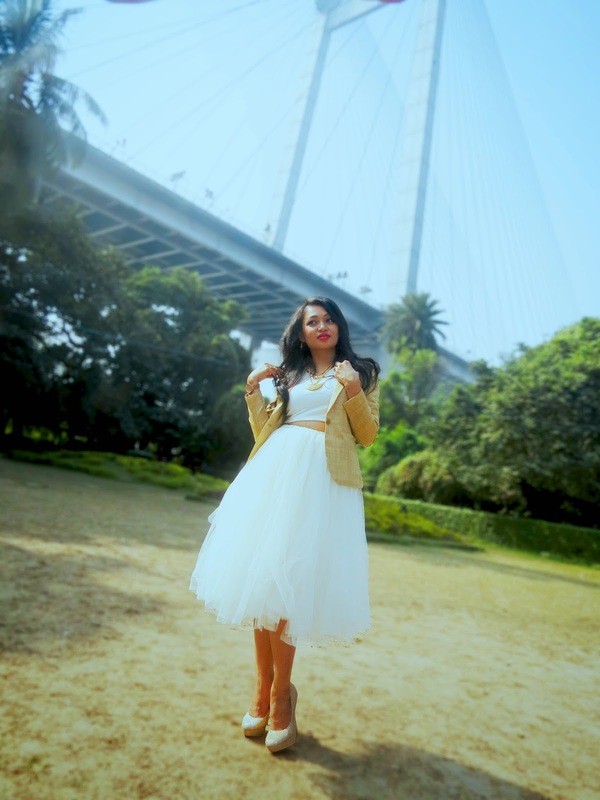 I would also like to mention that I DIY'd this Tulle Skirt. 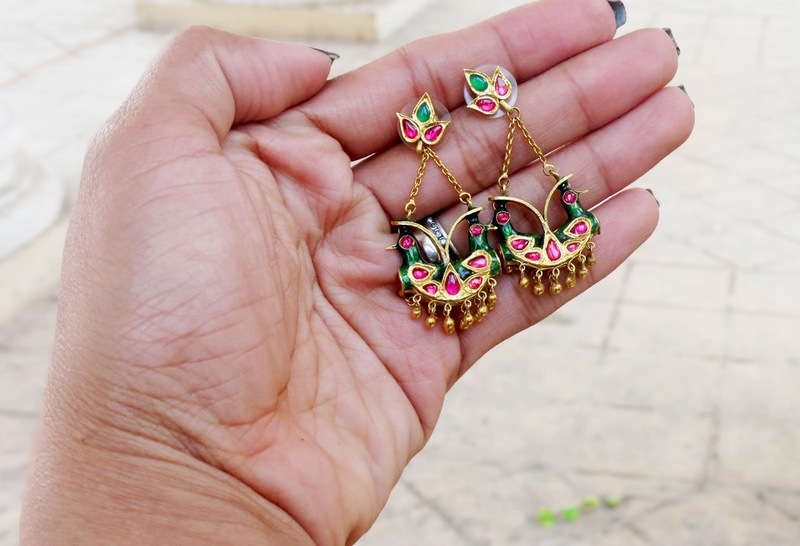 The Luka Paro Ear Ring. For the Second look, I replaced my Muga Blazer with this Pleather jacket to go with the Dug Dugi Pendant that am wearing attached with the black beads along with the matching ear ring. Dug Dugi is a design inspired from a leaf. This Dug Dugi is the most precious jewellery that I own. The reason being, I inherited this from my Mother. She gave this to me in my wedding and am very sure I will keep it safe to pass it on to my future daughter or daughter-in-law as a future heirloom.Now that I have mentioned #fututreheirloom, I would also like to contribute this story to Lovegold to be shared with their stories. The other one is known as Pepa, a design inspired from a musical instrument. The Musical Instrument Pepa is nothing but a Buffalo's horn, mostly played with folk music Bihu. 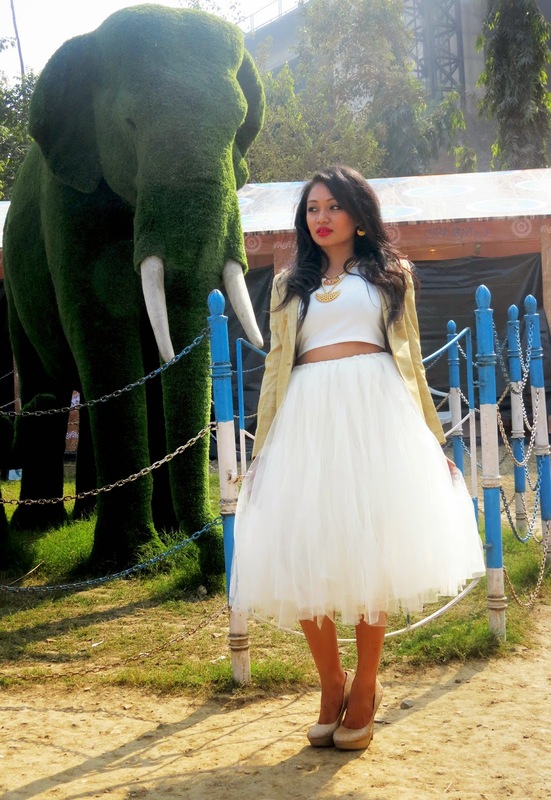 I hope you liked this post and enjoyed reading about Assamese Jwellery and Muga Silk. 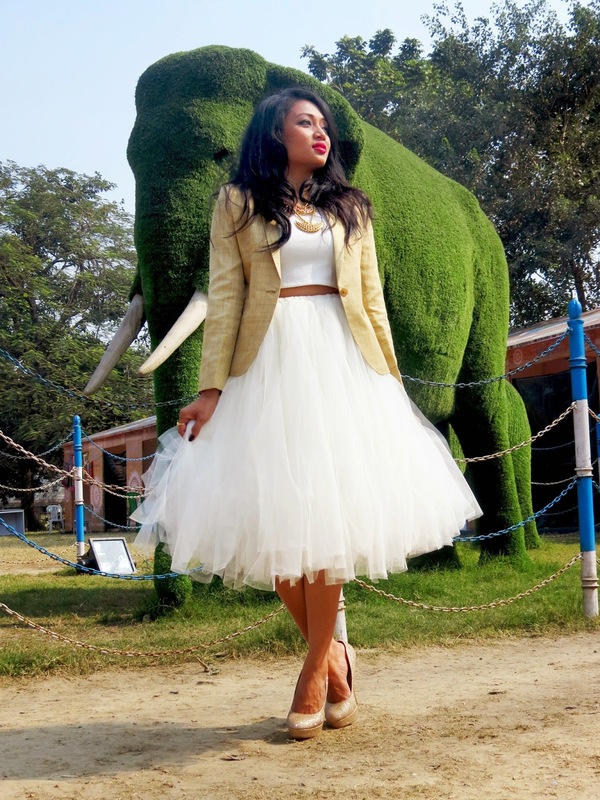 Beautiful look, I love the gorgeous tulle skirt and the jewellery is absolutely stunning! 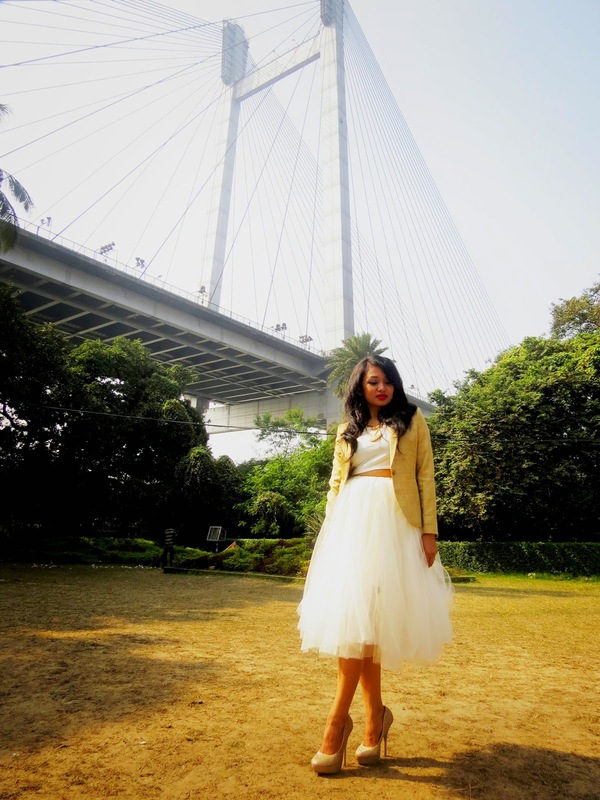 Anoushka thanx a lot......m so glad you liked the skirt and the jewelerries.....it was really fun making that skirt. lots of love. Beautiful Anie! You look like a princess! Kileen thanx a lot.....m so happy to see you here....thanx for stopping by....lots of love...warm wishes for the coming year. Nice pictures, Nice post. I like the skirt a lot. Hi Teri, for the pictures. credit goes to the darling hubby..thanx a lot....m so glad you liked the post and my DIY skirt....means a lot....lots of love. 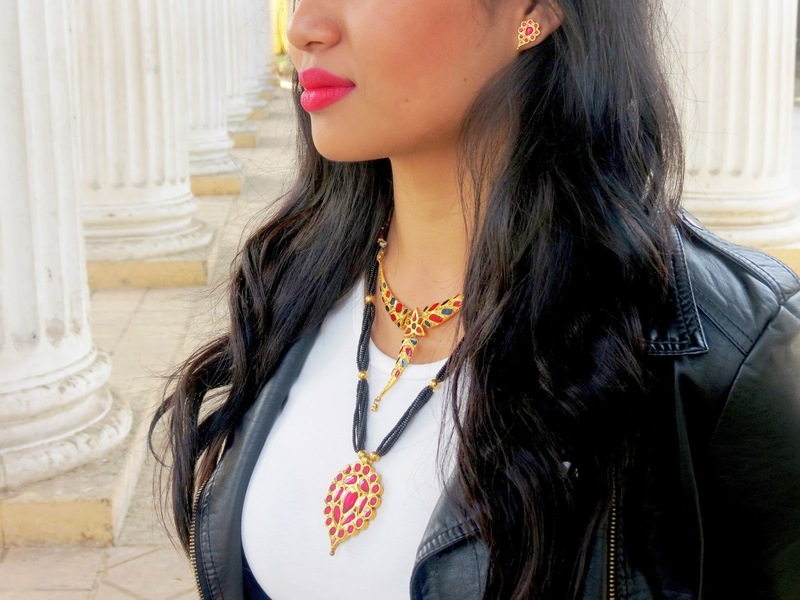 You look like a Disney princess (and that's a good thing), the jewelry is beautiful !! Awwww Imke thanx a lot....you just made me feel so special....lots of love.....warm wishes for the new year. Hey Yolisha......thanx a ton...m so glad you liked the first look.....its completely my creation right from designing and making it.warm wishes for the new year..lots of love. Hey Mel...thank you so much.....lots of love and good to have you back here. 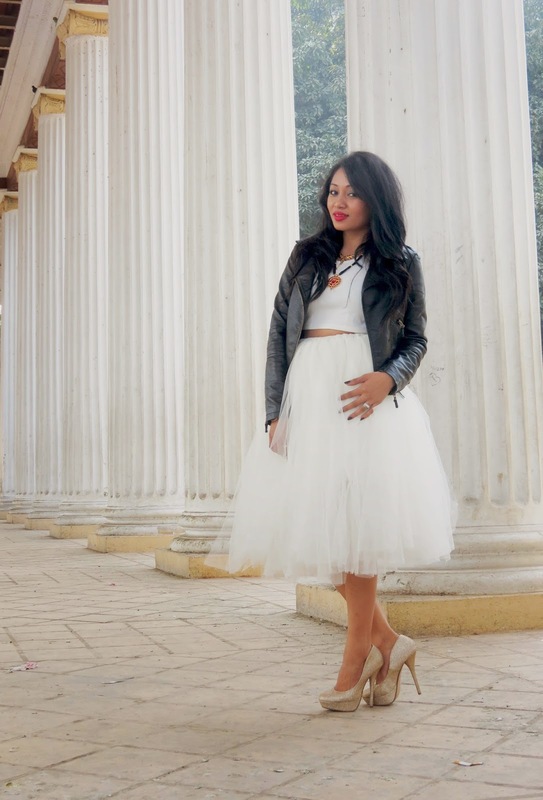 Lovely outfit, i have always wanted a tulle skirt! 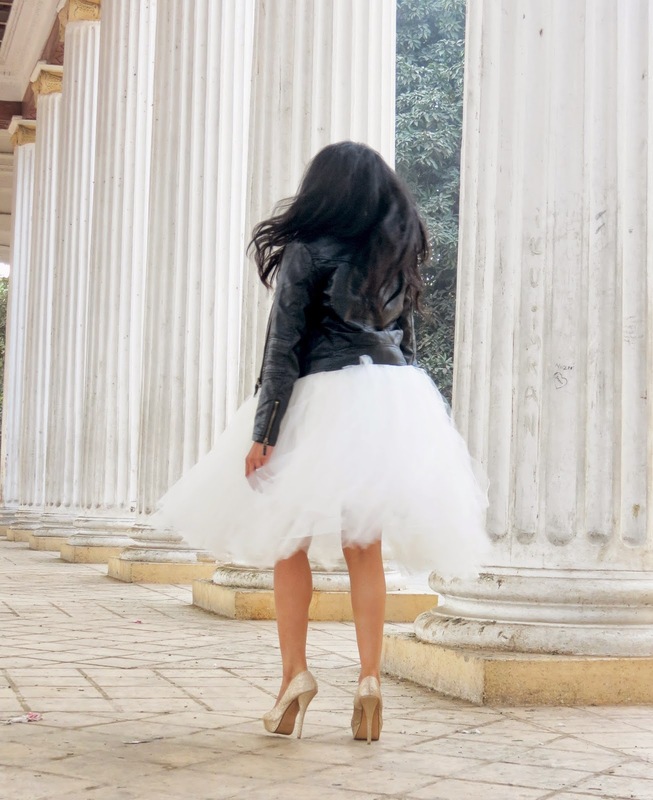 Hey Nikoline thank you so much...its a pretty easy no sew method to make this tulle skirt. you seriously can make it in no time .lots of love. wowwwww i love your skirt!!!!! ;) it's amazingggggggggg! wow wow wow skirt!!!!! perfection! Such a flirty look! Love it and you look beautiful. Thank you so so so much Nilu....thank you for everything...most importantly for being there......love you. Happy New Year. You made this skirt, too?!?! Can I keep you? It's so gorgeous! Fabulous jewellery. You look great is these pictures.